You’ve heard about paddle boarding, the latest craze water sport. As always we are looking to push the limits on this enjoyable sport and see how far we can take it. From doing yoga on these boards to the new fad of using your paddle board for your next fishing day. We love the idea of loading up a cooler and hitting the lake for a day of fishing. The best fishing sup will be one that is stable with a heavy weight capacity to carry you, your gear and your catch. Paddle boarding is an incredibly fast growing sport and one that can connect with a number of different sports to make an extreme sport. A great workout in itself, paddle boards all carry main features that will be useful no matter how you intend to use your board. We love paddle boarding and combining a day on the lake with some delicious fresh trout to cook up for dinner can’t get any better. That’s why we have done our research to find the best fishing paddle board. 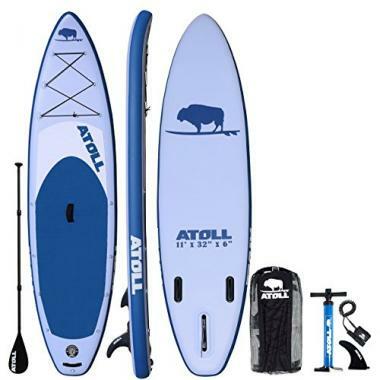 Atoll has been in the industry for some time now and has become an expert in paddle board design and now has taken it a step further making a design excellent for fishing. This board has plenty of storage. With 14 D rings and bungee straps on either side, it has more than enough room to hold all of your belongings. With a 3 piece paddle, you can easily take it apart and store it under bungee straps so you can focus on fishing. 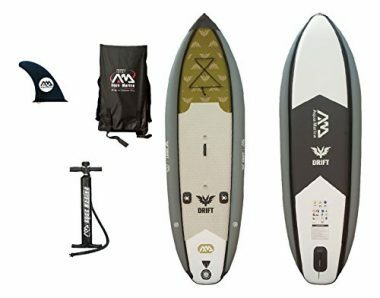 This fishing isup board rides like a foam board with a fully wrapped second layered material giving it all the sturdiness of a foam board with the durability of an inflatable one. With an EVA foam pad for nonslip purposes it doubles as a comfortable pad to sit on for fishing trips. This SUP is designed to give you everything you need to get in the water, and stay in. 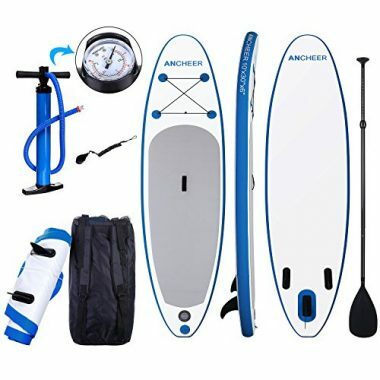 With adjustable fiberglass paddle, triple action high capacity hand pump, carry backpack and a heavy weight capacity this board is able to pack you and our gear. Use some of your D rings to secure your paddle while fishing and load a cooler on board. You will not feel cramped on this spacious 11-foot long board. Despite its size, this fishing isup board is one of the lightest fishing sup boards we have yet to come across. Still not convinced? iRocker has added a 2 year no questions asked warranty to sweeten the deal. Now that’s a good buy. The Adventurer 2 is a top of the line paddleboard that is perfect for fishing. It’s wide 37-inch stance creates a stable platform to throw your cast. It’s 6-inch thick ride height allows you to wear shoes without getting wet. Go where a boat can’t take you with this paddle board. You will be catching fish in no time with the Adventurer 2. Included in the package is everything you need to get on the water. The paddle is high quality and easily stored in a compact backpack. 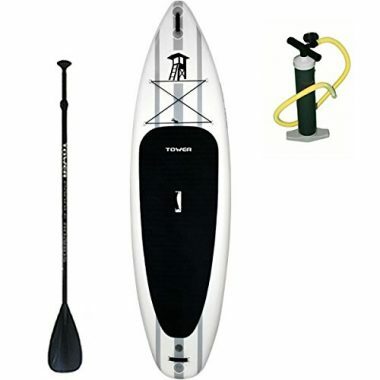 The pump will inflate the fishing sup board to its recommended 15 PSI without strain on your body. This board is a great overall package. It is excellent for fishing and paddling on the open water. This board has been designed to give the best experience to beginners and to advanced riders. The balance with this board is just right. The 6” base gives you the stability you need when you are in any water condition. The aluminum paddle is also completely adjustable, so you can find the length which gives you the most comfort. This also allows you to adjust the paddle size to your height. The military-grade materials also make this a board which is going to last. I mean, if it is good enough for the military, then it is good enough for us. The inflation of this board is quick and easy and can be done with the included pump. You can carry everything to the water in the included backpack, and when the board is inflated, you can store everything in the backpack to see it all organized and dry. We love the addition of a GoPro mount, to help you capture every moment when you are out on the water. 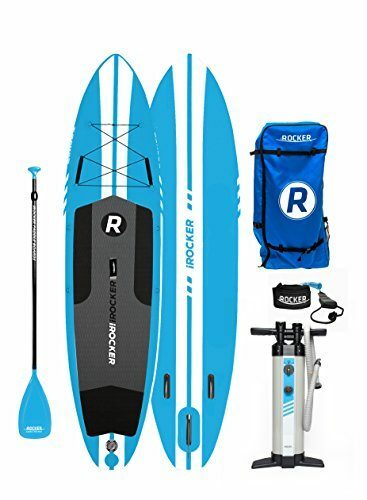 This is a great board for a beginner and comes with everything you need for your trip on the water. It is also a great board for experienced users, and the maneuverability is good enough for the most advanced riders. This board contains everything you need togged started with paddleboarding. The board comes with a handy paddle to get you through the water, a backpack for great storage and portability, a pump to quickly inflate your board, a removable seat, and a waterproof phone case. We particularly like the addition of a seat. You can stand when you want to, and sit when you have to. The crocodile-like skin on the top also offers great stability, making this a great beginner paddleboard for adults and for kids. The 30”-wide deck also offers a great platform for you to stand on. You can move about and get comfortable, without ever worrying about the board tipping. This board is solid with its Korean drop stitch construction making it incredibly durable and stable. Riding like a rigid board this is excellent for beginners and intermediates alike. Its sturdy performance makes it a great option for fishing and long distance rides. Features like a diamond groove pad will give you the confidence to throw a long cast while heavy duty D-rings allow you to pack a cooler and all of your gear on board with you. The package includes a foldable paddle, pump and carrying case. It also rolls into a compact package making it easy to throw in the included backpack. This is a great board for beginner paddlers. The board has been designed to be versatile, and not only will you be able to paddle this board with ease, but you will also be able to do yoga on it, fish from it, and surf with it. The board will glide through the water with ease but will remain maneuverable enough to turn sharply and tightly. The extra width of the board offer you more stability when you are in the water, and the length of the board allows you to traverse through calm water and water with waves and surf. There is a grooved handle on the side which makes it easy and comfortable to carry. It is also light enough for you to carry long distances. The board has been thermally molded to eliminate waste in the production process, and also give the board a durable and stylish finish, while still remaining lightweight. When you deal with Isle, you get the very best in customer service. You can try out the board and return it within 60 days for a money-back guarantee. They were born and bred on the waters of California in 2004, so they know a thing or two about paddleboarding. The creators of this board are avid paddleboarders, and the board has been crafted with the user in mind. 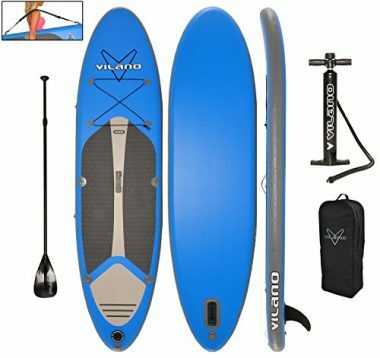 This is one of the best paddleboards which we have found for fishing, and there are two specific features which make it so. The first is the inclusion of rod holders. There are two rod holders on the board, which will allow you to sit back and relax while you are waiting for the fish to bite. You can sip on your favorite drink or take a bit of your sandwich, without having to worry about your rods. The second feature is the inclusion of a fish cooler. There is a fish cooler which sits on top of the board. When you catch your fish, you can store them safely without having to worry about the fish going bad. The cooler also comes with a padded seat on the top and a backrest. There is also space to process any fish. You can sit back and relax with your rods in the holders. When you catch your fish, you can gut and cut the fish, and then store it in a place which will keep the fish cool. The double-sided rail on this board also give you extra stability, and there are bungee cords which can store extra cargo for you. This is the board you want if speed is what you are looking for. This is a no-nonsense board, which is fast, zippy, and lightweight. When you are moving through the water on this board, you will understand what paddleboarding is all about. This board is great for chasing down the fish when you are out on the water but sleek enough not to scare them away. There is enough room for you to set up your rod, and space for your tackle boxes and picnic lunch. There are lots of attachment points to safely secure your accessories, and you can even turn this board into a windsurfing board if you want to. The plush EVA pad wraps around the rails to give you the maximum amount of comfort across the board. The board is also large enough for you to do some yoga in it if you wish. The keeled nose gives you enhanced tracking through the water, with increased glide and cruise. The rail-to-rail volume also gives you enhanced stability and ensures that the pad of the board stays out of the water. 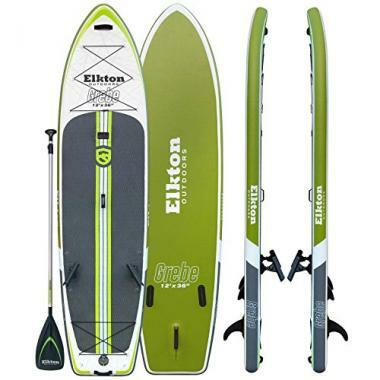 Elkton Outdoors have been creating paddle boards since 2006 and have used their knowledge to create the Grebe 12-Foot Inflatable Fishing Paddle-Board which is specifically designed as an inflatable sup for fishing. Their board is perfect for your next fishing excursion or just a casual paddle. With two rod holders, four fishing mounts and a seatback that folds up, this board has thought of it all. Not only will you be able to fish, but also sit back and relax while you catch your fish. The boards two storage hatches and a front bungee give it enough room to store both your gear and your catch. This sup fishing board containing a paddle clip so you don’t have to worry about losing your paddle while you’re busy fishing. 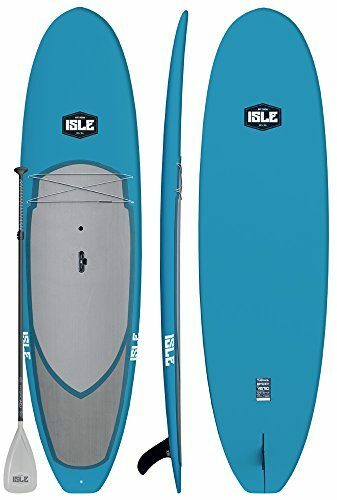 Fishing sup reviews for this board are overwhelmingly positive, this fishing isup board has thought of it all. 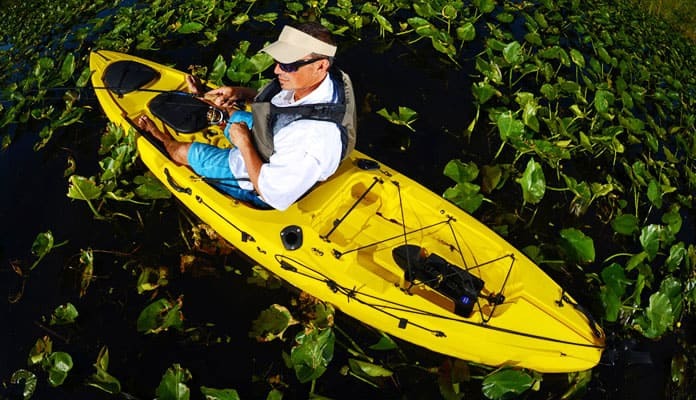 There are so many benefits to using your kayak and paddleboard for fishing. But which one is better? They both have their strengths, and weaknesses, so let’s get into it. Paddleboards, especially inflatables, are easy to carry and store. You don’t need a large house to store them which means they will be better for people in smaller apartments. You are also able to have more of an aerial view of the water. Being able to scout the area out will allow you to see if you’re in weeds or if there are schools of fish around you. Paddleboards allow you to sneak up on your prey. They don’t sit as low in the water like kayaks. Instead, they sit on top of the water which makes them more stealthy. You are also able to walk around on your board. If you don’t like the angle of your cast you can simply rotate your body instead of having to move your entire rig. The biggest con to SUP fishing is the lack of storage space. Yes, you will have a bungee system, even two if you’re lucky, but that is still significantly less than in a kayak. Your chances of getting wet on a SUP are more likely than that in a kayak. Both require balance, but paddleboards are significantly more vulnerable in the water. These are some of the best ways to fish as they are extremely portable and easy to use. There is an actual seat that you can relax in. Unlike a stand-up paddleboard where you have to bring along a kayak seat, kayaks will have a built in comfortable seat. You are also less vulnerable to Mother Nature. You can even bring a blanket for your legs in a sit inside kayak. 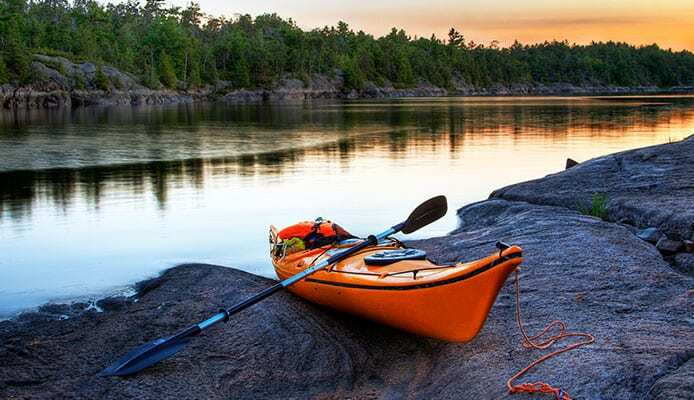 Kayaks or fishing kayak are also typically more stable than paddleboards. They sit lower in the water and are less likely to tip. You won’t have as good of a view of the water as a SUP. Since you are restricted to a seated position you won’t have the best view of the water. Kayaks are much more difficult to carry and get to the beach. You will have to have a roof rack or trailer to transport them. Which one is better you ask? That depends on your personal preference, the type of water you will be fishing on and your fishing style. Since SUPs sit higher in the water they are more susceptible to the water’s conditions. For example, if it’s windy and the water is choppy your time on the water will be rough. Also, if it’s raining the deck of your board can become slippery. Tides and currents can also affect how the board acts in the water. Bringing a small, compact, foldable anchor will make worlds of difference when you’re fishing. It takes enough concentration to throw casts without having to keep yourself in position as well. If you are fishing with more than one rod you will want to ensure your lines don’t get crossed. This is quite important especially when you have a big fish on the end of your line. You won’t want to have to deal with a knot which can divide your attention. Stripping Mat: This is a spiked mat that sits under your feet and works to collect your line as you get your fly. This is especially important when you are going through choppy waters as it will keep your lines from tangling and flying off your board. Stripping Basket: This is worn around your waist and serves the same purpose as the mat. Choosing between the two can be purely based on personal preference. As SUP fishing has grown in popularity, there are many different accessories that you can buy in order to dress your board to your desire. Be sure to see what is available and choose the features you want to have. You want your gear to be easily accessible while you are paddling as this will allow you to change your fishing gear with ease. In order to make that happen there are two ways you can pack it. The most popular way to do so is to attach your gear to your SUP deck. Otherwise, you can pack your gear into a carrier and strap it to your back while you paddle, although this can make your time less enjoyable. Regardless, you will want to pack all of your gear in a dry bag to ensure it stays safe. A paddle board that is good for fishing will have features that are different than a standard board. Fishing on a paddleboard is a new twist on an already fun and popular sport. Companies have put time and money to design boards that specialize in this new activity. When looking to buy your next sup fishing board we recommend looking for the following characteristics. This will ensure that your board still remains afloat despite having a heavy load on. Nothing is worse than a board that is struggling with buoyancy when you are fishing. Ensure that your SUPs capacity accounts for your weight, and the weight of all the gear you intend on packing with you. Width: Fishing on a paddleboard can be tricky if you don’t have the balance and stability to throw the perfect cast. A wide board, 30 inches or more, will not only give you the stability, but also allow you to get into the right stance. Also, it will give you the confidence to ride in choppy weather. Thickness: The height of the fishing sup board will also come into play when fishing. Boards that are around 6 inches thick will ride high enough that no water will crest the board. This ensures that your feet will not get wet even if you are only wearing socks. A thicker board will also not flex when going over choppy water. Keep in mind this directly corresponds with weight capacity as heavier weights on a board will sink it more into the water. Length: A longer board, when coupled with a wide stance and high frame, will create the ideal fishing sup. The length ensures that you can carry all of your gear and have enough room to move around freely. Most boards come with some sort of padding on the board. When fishing it is important to make sure this is sufficient to stand on. Grip will not only allow you to stand comfortably, but will make your tackle and cooler not slide around when in choppy water. Boards nowadays are thick enough. An easily overlooked aspect of a paddleboard is the seating area. While paddle boards are typically designed for standing, when using for fishing you will spend quite a bit of time sitting. You want to be comfortable doing it. Paddle boards typically come with a foam non slip pad that will act as a foam comfort pad to sit on. 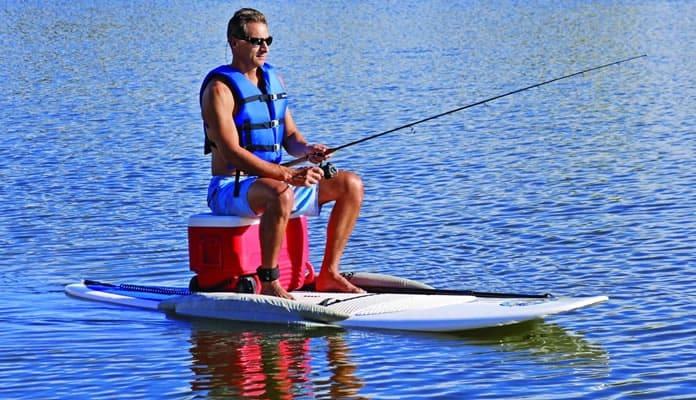 Some paddle boards even go as far as to have a seat back that will provide back support while you fish. SUPs come as either a hard material or an inflatable “soft” material. Often we associate items made from hard materials to be the most durable but this isn’t the case with paddle boards. Hard materials typically refer to any sort of foam or hard plastic design where the board is rigid and does not collapse in size. These boards ride rigid and are excellent for beginners or those needing more stability. They also typically come with large non-slip foam pads for added grip. Inflatable paddle boards are made using incredibly high-quality PVC that is sometimes military grade. They do not dent, bend or crack and collapse to fit into a backpack. Often riding like a rigid board, these boards are strong enough to bring your pup on board without fear of his nails causing damage. Having a board equipped with a space to hold your paddles while you fish will provide a much needed peace of mind. Having to hold onto your paddle while you are fishing can prove extremely inconvenient and take away from your experience. 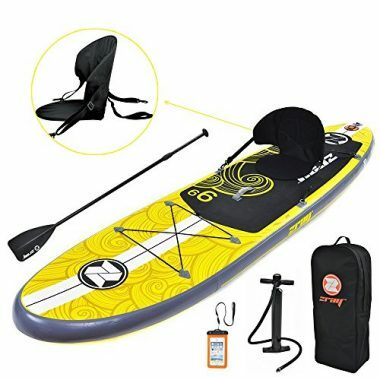 If your board doesn’t have a designated space for this, buying a paddle that comes apart into smaller pieces that you can store under a bungee strap will have the same effect. This can be as simple as some D-rings or as fancy as an enclosed cargo bay but never undervalue the usefulness of having storage space on the board. Having an enclosed storage bay is ideal as it can be turned into a cooler. Having a place to store your fishing poles and tackle will give you peace of mind while fishing. One way to tell the quality of a paddle board, and the confidence of the company, is to see how long they will warranty a board for. A one-year material warranty is standard, but some companies include a money back guarantee and a warranty that stretches up to two or even three years. Q: How to trick out a paddle board for fishing? A: There are many things you can do to get your paddle board tricked out for fishing. A cooler can become the perfect seat while also keeping your beverages and food nice and cold. Some also have rod holders that can hold your rod and fishing net when you’re paddling out. A lightweight anchor can also hold you in place while not taking up a lot of storage space. You should also plan to have a waterproof backpack strapped to your paddle boards rigging. These handy pieces of gear make a watertight seal which allows you to bring your camera gear to get the best photos. 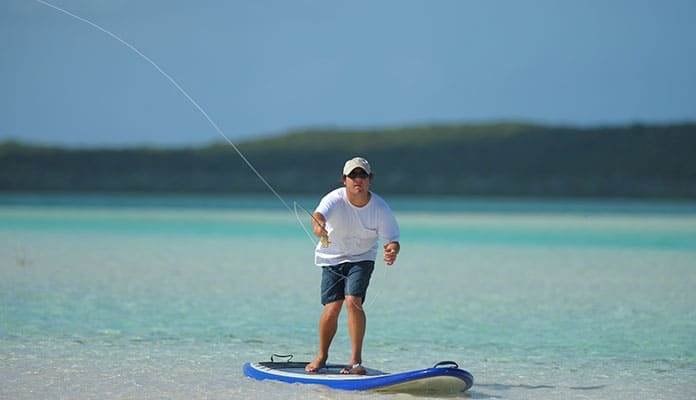 Q: How to stabilize a sup for fishing? A: Specially designed fishing SUPs will have built in systems that add stability to your time on the water. If you find that this is still not enough there are inflatable pontoons you can attach to your board which ensure you can walk around without tipping at all. These add ons will make it slightly more difficult to paddle but can give you the ability to go out even in rough waters with ease. We strongly recommend boards that are at least 6 inches thick to fish on. This will allow give you the capacity you need for all your gear. It also ensures that you can sit above the water without getting your feet wet. This may not sound like a big deal but it will allow you to take out your board even in the winter. Q: Where do you put fish when sup fishing? A: Many people bring along a garbage bag that they put in their cooler. This will keep your catch separate from your food and beverage while keeping it cold. Other people like to bring along a separate bucket especially for their catch. The only issue with this is that it can heat it up if you spend the entire day on the water. Q: Where to put sup paddle when fishing? A: If you are planning on using your SUP to fish we suggest getting paddle clips. This will attach to a part of your boat and allow you to strap your paddle to it. You can then use both hands to get set up and throw the perfect casts without your paddle floating away or balancing precariously on your board. Paddle boarding can be a very serene and meditative hobby, as is fishing, so it makes sense that these two would be combined. To ensure you get the most out of this fun and relaxing excursion ensure you pick a board you are comfortable with and one that will support you and your gear. Fishing sup boards are quickly becoming a popular trend and companies are putting more focus on ensuring that their boards meet your standards. All of the boards on our list are excellent for both sup use as well as to catch fish. 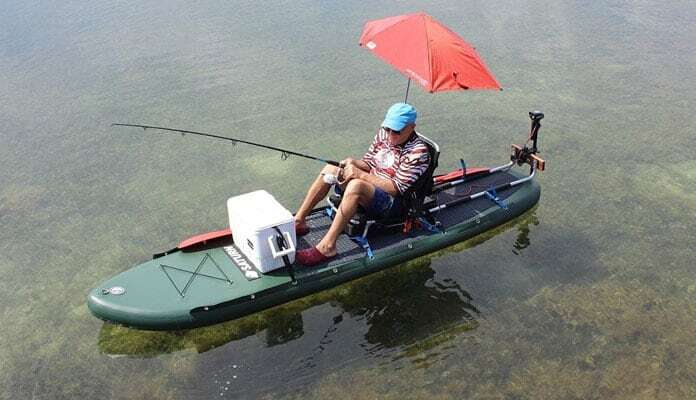 Ever used your SUP for fishing? Have a board on our list? Let us know how you like it in the comment section below.